vokul 1.2.6 is available now! The update fixes audio issues when running under iOS 6. How is vokul different from Siri? 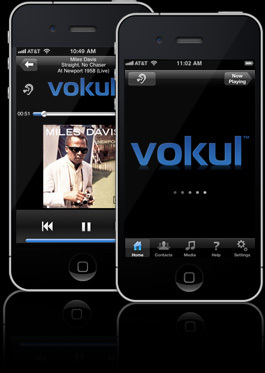 vokul works on the iPhone 3GS and later, iPod touch 3rd generation and later, and all iPad models. vokul's "Always Listening" technology allows you to focus on what you're doing – you don't need to press any buttons. With vokul, name and music lookups are performed on the device, for a faster and more reliable experience! You can post to Twitter and Facebook, and listen to your social network feeds with vokul. vokul gives you full control of the media player using voice commands, even while audio is playing! vokul allows you to adjust the playback tempo of podcasts and songs (Fitness Mode) using your voice! vokul works on iOS devices including the iPhone 3GS and later models, iPod touch 3G and later models (iPod touch 3G requires an external mic), and all iPad models. Dread that long work commute? Looking for a safer way to stay in touch while on the go? Get vokul – a powerful new voice control app for your iOS device! vokul is the first and only 100% handsfree voice control app for your iPhone, iPod touch, and iPad. With vokul, you can DJ music and podcasts, dictate text messages and emails, post to Facebook and Twitter, and call contacts in your address book – without pressing any buttons! Launch vokul and connect your device to your car stereo system* for the ultimate handsfree audio experience! Get the vokul advantage, available in the App Store for just $2.99! Freeform Dictation for Texting and Emailing — Now with Bluetooth! With version 1.2, it's easier than ever to dictate and send a text message or email while on the go. vokul guides you through composing and sending your message with clear and pleasant voice prompts. Version 1.2 adds Bluetooth operation. * It's the safest way to send a message while driving! Post to Facebook and Twitter — Completely Handsfree! New in version 1.2, you can post to Facebook and Twitter using just your voice. You can also listen to your Twitter timelines and Facebook newsfeed as a live audio stream. Just say "vokul play Facebook" or "vokul play Twitter" to hear what your friends are saying. Use vokul's media player voice commands to control playback – just like when listening to a song, podcast, or audiobook. Ask vokul to play something from your iTunes library by saying a portion of a song name, podcast, audiobook, album, artist, genre, playlist, or iTunes U lecture. You can say as little or as much of an item name as you know, and vokul should find it fast – no network connection necessary! vokul's Fitness Mode is great for runners, cyclists, and athletes – playback tempo can be adjusted to match workout pace with voice commands like "faster" and "a little slower." Shortened media player voice commands allow you to focus on your workout. Unlike other voice control apps, vokul can be controlled entirely with your voice. vokul responds to your commands only when called upon – just say "hey vokul" to get vokul's attention. You can even say commands while audio is playing, thanks to vokul's acoustic echo cancellation (AEC) technology. With vokul, button presses and distracted screen glances are a thing of the past! If you need help using vokul, please email us. vokul currently does not support reading received text messages, due to limitations imposed by iOS.